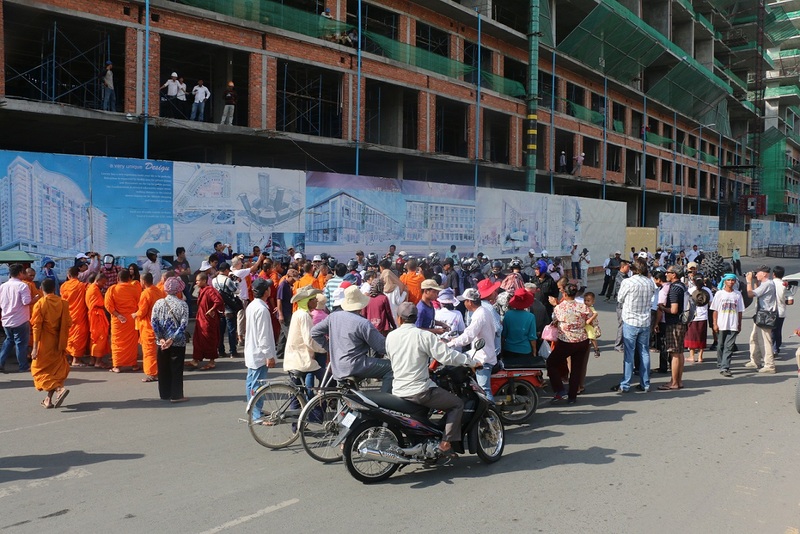 At 8:00 am, May 20, 2014, over 300 peoples from land and housing affected communities, farmers and monks were gathering in front of Phnom Penh Municipal Court to call for justice and release Mr. Vorn Poa, Mr. Chan Puthisak, Mr. Teng Savouen, and others 18 victims who were arrested since early January 2014, while a number of Human Right observers from different NGOs monitored the case very closely. While the hearing is ongoing at municipal court, the violence occurred outside the courthouse where the barricades and riots police blocked the rallied from moving forward to the courthouse. The security guards of the City Hall tried to push the protesters back and far from the barricades, with kicking the monks and protesters caused the situation tension between the protesters and polices. However, there were no serious violence after the protesters moved up together to protect the monks from being beaten from the security guards. There were many polices with 3 Fire Trucks, blocking the road in front of the Municipal Court while the trial of the 23 was in the process. The trial has started again at 2:00 pm and ended up at 4 pm. It will be continued to tomorrow at 8 am, as promised by the court.